"A scientist is someone who is inquisitive about life." Maggie Aderin-Pocock studied physics and mechanical engineering at Imperial College, London. She has designed instruments from hand-held land mine detectors to a multimillion pound spectrograph for the Gemini Observatory in Chile. 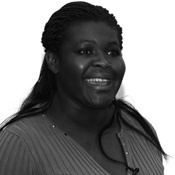 Dr Aderin-Pocock works at Astrium Ltd. in Portsmouth, UK, where she leads the optical instrumentation group. Here she manages a range of projects making satellite sub-systems designed to monitor wind speed and other variables in the Earth's atmosphere. Dr Aderin-Pocock is the recipient of a fellowship at University College London, sponsored by the Science and Technology Facilities Council, which enables her to devote part of her working time to science communication. She also does some of this work through her own small company, Science Innovation Ltd. Through this she conducts 'Tours of the Universe', a scheme she set up to engage school children and adults around the world in the wonders of space. "By looking at other planets in the solar system we can understand our own planet more," says Dr Aderin-Pocock. "The Casini-Huygens probe is an amazing piece of engineering, because it travelled one billion miles to get to the orbit of Saturn and land on one of its moons. You can actually listen to the sound of this moon's atmosphere on the Internet. To me this is fantastic with current technology."